IMHOTEP is not only one of the longest running zines hailing from Norway, it has always been a good address for high quality reading in general already. But with this 11th issue editor Roy once more surprises with a totally unique idea of zine making. Instead of filling the pages with a bunch of band interviews and reviews or special reports about certain scene related topics (which all most certainly would've been a great read in their own right as well), this issue just features 3 bands (hence the issue's subtitle "Trinity"): ABIGOR, MAYHEM and WATAIN. 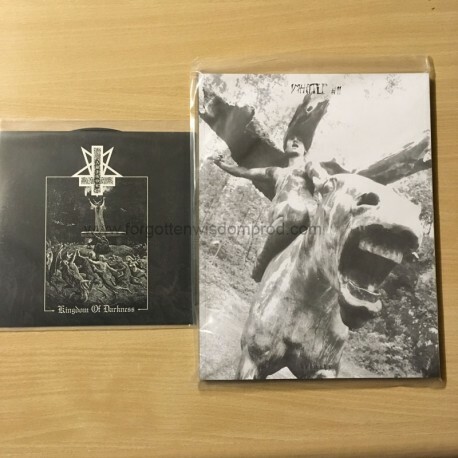 If you've followed Roy's work a little bit lately, you might be familiar with the WATAIN part, which previously had been released totally on its own already and originally wasn't even planned to end up in this issue. But since it's done in the same way as the ABIGOR and MAYHEM features, it definitely made sense to include it here as a bonus as well. So, what exactly can you expect from IMHOTEP # 11 then? After all this issue offers 86 pages in total (with no fancy layout blowing things up to the max)... Each band gets maximum coverage and the interesting thing about it is not only the depth of each feature's questions, but the fact that several different interviews from different time periods have been combined to one big piece here in order to come up with the ultimate source of information. If you already thought that SNAKEPIT's Laurent Ramadier comes up with long, in-depth features, think again, because after you've finished reading this issue you probably will know more about ABIGOR, MAYHEM and WATAIN as the closest friends of those three bands. As already mentioned, a layout (in the typical underground style) is almost non existing. This zine visually is a lot closer to a book and each page is layouted in 2 columns with only a couple of pictures thrown in here and there. But don't worry too much about this. You won't miss your skull'n'bones, believe me, since you'll be fascinated way too much by the content of the features. The issue gets completed by 4 pages of incredibly critical reviews. Some of the stuff is already a couple of years old and was re-visited for a new review many years after its original release (another very cool idea to me, because taste often changes over the years).